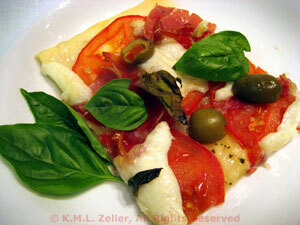 Easy Dinner from Thyme for Cooking: Pizza Margherita. Typically, a Margherita only has tomato sauce, mozzarella and basil... And 4 olives. I have added Prosciutto, onions, garlic, oregano and Parmesan. I make this at least once in the fall, when I have lots of garden ripe tomatoes and fresh basil. Traditionally, the olives should be whole, black, with pits... I use pitted.